This species prefers firm desert surfaces of saline flats and gravel plains to true sand desert and dunes. The Baluchistan Gerbil is nocturnal, and may live in colonies. They consume seeds, fruit, and grasses and are also known to feed on camel dung. They forage between clumps of vegetation, and move into vegetation or their burrows extremely fast when alarmed. Reproduction is associated with winter and spring. Gestation lasts three weeks, usually resulting in 1-5 babies. 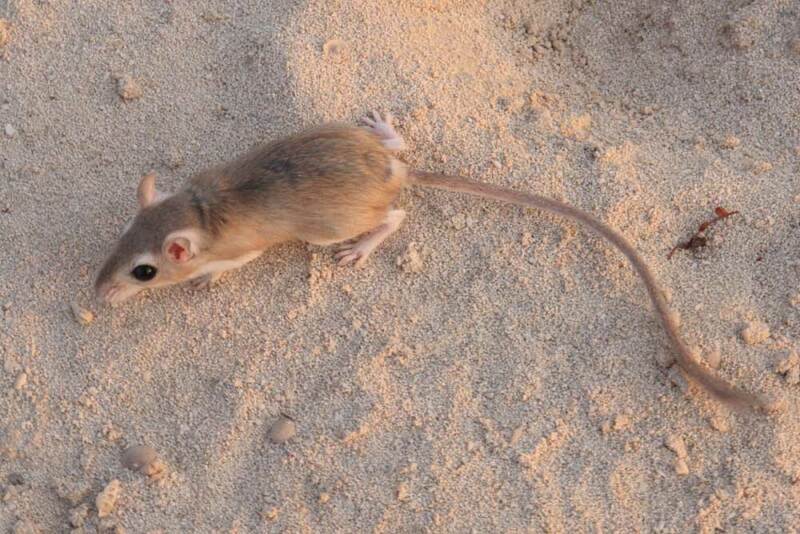 In Qatar this is the most common gerbil species on the gravel and rocky plains over most of the country. The Baluchistan Gerbil is a small and widely distributed desert rodent. It has a sandy fawn or greyish upper body with white undersides, separated by a clear demarcation. The tail is long, with a prominent, dark tuft on the end. This species has naked palms and soles on the feet, unlike those of Cheesman’s Gerbil.